If you are using Chrome (and you are on the Student Overview page – not seeing any data), please check to see what version you are using. If your version starts with a 53 and lower, you will have issues. Anything with a 54 and higher, you will be fine. 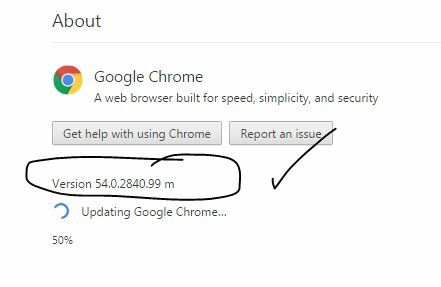 If you fall into the 53 category and don’t have time to ask your technical team to update you, use another browser (other browsers do not have issues). explain what you were trying to do and what it “did” that you did not expect. if you received an error message, please capture a screenshot. If you cannot replicate the error to obtain a screenshot, it’s okay: just tell us what you were trying to do and what it did that you did not expect. If you are an academic advisor, please connect with your supervisor. If you are not an advisor, but have access to this information, please email oncourse@osu.edu.